I just wanted to remind all of you that the Vistaprint Coupon offer that we posted back in the beginning of October is still valid as of right now. If you enter the online coupon code for Vistaprint (BEMERRY) at checkout, you’ll get 50% off any card or calendar purchase! 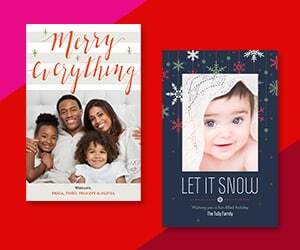 That’s an incredible value and a great way for Vistaprint to thank all of its customers for such a wonderful year. Vistaprint merchandise makes for a thoughtful gift for that special person in your life.